As gruesome as it seems to us today, public executions used to be a source of entertainment for the whole town. Families would walk to the town square where they would watch a convicted criminal be killed in any number of ways. 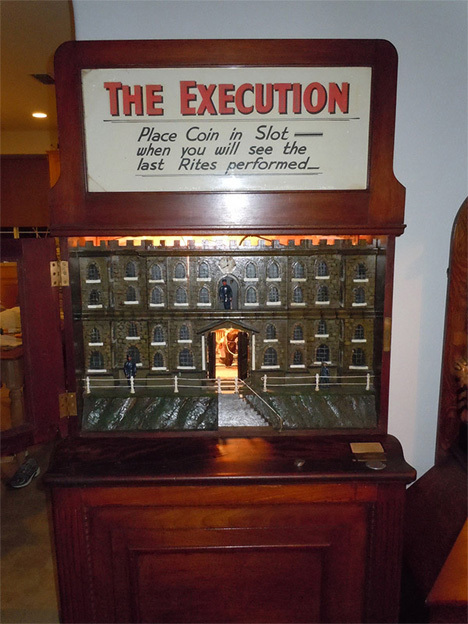 Not exactly the kind of thing most of us would enjoy today, but back in the 1920s English toymaker Charles Ahrens decided that it would make a delightful penny arcade game. Surprisingly, at least one working model still exists and is being offered for sale on eBay at the probably-reasonable asking price of $17,499.99. In the demonstration video, the seller shows how, after feeding a coin into the machine, the interior lights up and the doors open. Inside you can see three figures assembled around the condemned man. 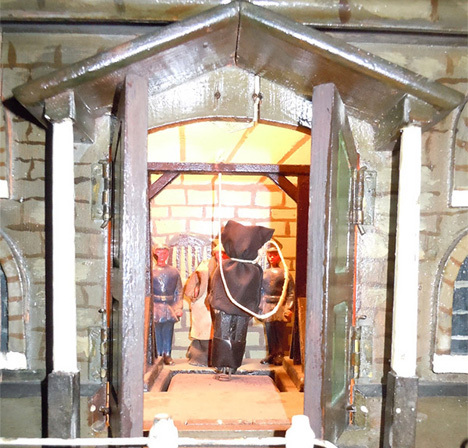 A few tolls of the bell and the bottom drops out beneath the convict, letting him drop to his supposed death. The gruesome subject matter of the display doesn’t detract from the excellent workmanship and beauty of the machine itself. The one-of-a-kind cabinet brings the macabre display just up to eye level for a child, perhaps giving them a warning about what happens to people who choose a life of crime. According to the seller, this machine has even been converted from accepting English pennies to taking American quarters. See more in Antique Gadgets or under Vintage & Retro. May, 2013.